A flock of Canadian geese has made their home this winter at the Phoenix area golf course down the street from me. As I was passing the first tee, I noticed some golfers teeing up while the geese stood by a few feet away. It looked like the geese were waiting their turn, and I thought perhaps a golfer would be there to give them some tips. 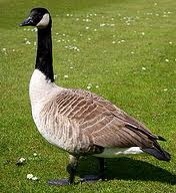 Professional golf instructors will tell you, “Never try to teach a goose to golf. It won't work and it annoys the goose.” However, golfers like nothing better than giving instructions to beginners. “Keep your left wing straight. Point your beak down at the ball.” It's not bad enough that these golfers don't know what they are talking about, they also don't know anything about training methods. What do you do call it when someone who doesn't know his subject matter, and doesn't know how to teach, attempts to educate somebody who doesn't have the tools to learn, and isn't motivated? It's a training seminar. Trainers need some knowledge of their subject matter and, more importantly in my mind, they need to be trained to train. Trainees need to have the ability to learn and apply the training material, and they must be motivated to do so. Unless each of these four criteria are met, training seminars not only won't work, they'll annoy the trainees! This entry was posted in Business, training and tagged education, learning, teaching, training. Bookmark the permalink.